Russia’s capital city has grown from a fortified area on the banks of the Moskva River to a sprawling metropolis teeming with Tsarist architecture, Soviet landmarks and cultural delights. Prepare for your visit with insight into its history, culture, cuisine and transportation networks. The founding of Moscow is credited to Prince Yury Dolgoruky who, in the 12th century, ordered the construction of a wooden fort on the shores of the Moskva River. It was a site chosen for its strategic positioning, allowing for effective defence and later, the policing of commercial traffic along the river. This location dramatically increased the importance of early-day Moscow as the area became wealthier and a defensive powerhouse against invading forces. Moscow continued to grow in size and might, absorbing and uniting the areas around it in the 13th century and finally becoming the national capital in the 15th century. Cathedrals, towers, roads and fortifications were built around the original wooden fort (which was to become the present-day Kremlin) and by the close of the 15th century, Moscow was larger in size and population than London and Paris. The city has lived through great fires, invading Napoleonic forces, the loss of its “capital city” status and the introduction of Communism, with each phase, shaping its culture, politics, architecture and landmarks. 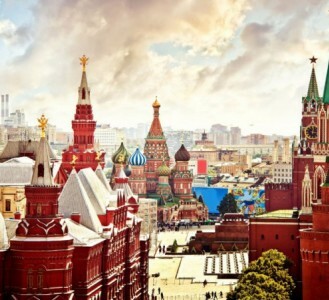 Moscow is home to some of Russia’s most iconic buildings and landmarks, including the Kremlin, St Basil’s Cathedral, Red Square and Gorky Park. Fortunately, these tourist drawcards are centrally located and within walking distance from each other, making for an easy day of sightseeing. For the easiest access to Red Square, use Teatralnaya metro station as a starting point for your exploration. A number of metro stations are located within the area, allowing you to explore the city’s intricately designed underground stations which are an attraction in their own right. Simplify your metro experience by buying a multi-journey ticket which allows you to reuse your ticket for a set number of journeys, regardless of their length. Take a break from the rigours of sightseeing with a meal or refreshment in a Russian restaurant or café. Look out for those serving Russia’s best-known local dishes, which include pancake-like ‘blinis’, ‘borscht’ beetroot soup, ‘pelmeni’ stuffed dumplings and a stuffed savoury pastry called ‘pirog’. Dr Zhivago, located opposite the Kremlin in the Hotel National, is a good choice for updated Russian classics in a convenient location. While souvenirs can be bought on-site in the Red Square vicinity, those looking for a larger variety can head to Vernisazh, a flea market selling Cold War memorabilia in addition to Russian nesting dolls, hand-painted wooden handicrafts and amber jewellery. British passport holders must obtain a visa before travelling to Russia. It’s an intensive process, so give yourself ample time to complete the required paperwork and have it processed. The currency in Russia is the Russian rouble (RUB). Most large hotels, restaurants and shops accept credit cards although taxi drivers typically only take cash. It is an offence to exchange money on the streets in Russia, so if you take foreign currency (dollars and euros are recommended), exchange it at banks or airport bureaus. Taking photos of military establishments or sites of strategic importance, including airports, is prohibited so take note of any signs stating this. Moscow experiences warm summers and cold, snowy winters with the hottest month falling in July and the coldest in January. Russian policemen occasionally stop tourists to inspect their passports, visas and registration so make sure you’re prepared for this eventuality. 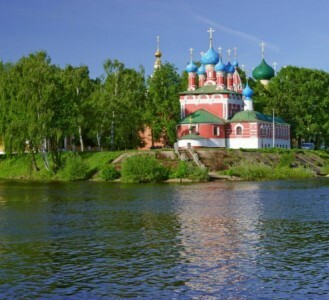 Cruise the mighty Volga, Europe's longest river, from St Petersburg all the way to Moscow.